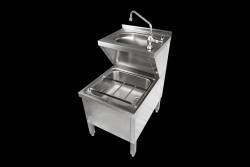 Our stainless-steel janitorial units and bucket sinks are designed for maximum wear. Ultra-robust and durable, they are made from 304, food-grade steel, which is not only antibacterial but is also easy to clean and maintain. The full janitorial configuration features an upper basin for hand-washing and a lower bucket sink. Ideal for use in kitchens and caretaker’s cupboards, the unit allows for the filling of buckets and/or the rinsing out of catering equipment. The integral upper hand-wash basin ensures hygiene requirements are met – vital in a healthcare or catering environment. The ultimate in practicality and ease of use, our janitorial units are supplied with rear mounting brackets and adjustable front legs, for ease of fitting and levelling. Super-strong and impact-resistant, they will cope with the heavy usage requirements of a hospital, clinic, supermarket, factory or catering environment. The integral waste grate helps to keep drains clear of blockage, and the robust, hinged bucket grating is designed as a platform to keep the base of buckets dry. Please view the size chart, for full specifications. Our range of products for the cleaning and sanitary industry also features stainless-steel wash troughs, urinals, shower trays, bespoke sink units, security sinks, lockable cupboards and hand-wash basins. Get in touch today, to discuss your requirements. Designed for use with wall-mounted taps, this space-saving mop sink is ideal for siting in a cleaner’s or caretaker’s cupboard. Made from 304-grade steel, it is highly robust and impact resistant – perfect for the tough usage needs of a caretaker’s or cleaner’s role. integrated waste grate, to help prevent drain blockage. 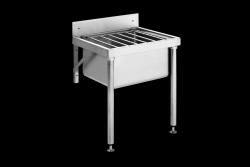 We offer a wide variety of other products for sanitary and cleaning applications. Take a look at our vanity tops; hand-wash basins; cupboards; sink units and cupboards. Alternatively, contact us today, to find out how we can supply the precise items you need for your project.